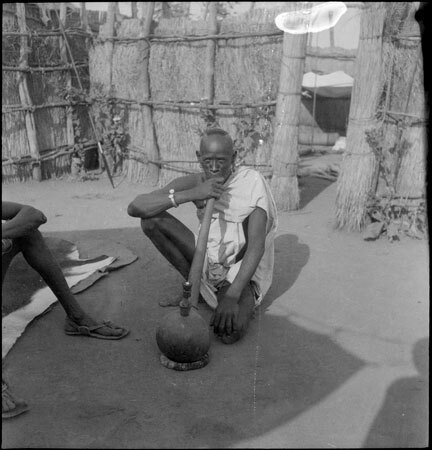 A man smoking a gourd water-pipe within a homestead courtyard. To the left a man is partially seen sitting on an animal skin rug. This partially-visible man wearing sandals is seen in several other images from within this homestead. Morton, Chris. "Anuak man smoking water-pipe" Southern Sudan Project (in development). 03 Jan. 2006. Pitt Rivers Museum. <http://southernsudan.prm.ox.ac.uk/details/2005.51.104/>.